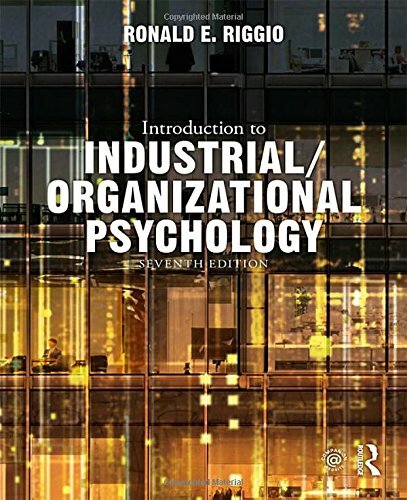 Introduction to Industrial/Organizational Psychology provides an accessible approach to psychological theory and its applications to the world of work. Using both classic theories and research along with the latest developments and innovations, this student-centered text shows practical applications of theoretical concepts using examples from work situations that students may be familiar with―such as service industries, internet companies, and startups―in addition to traditional office and factory work settings. Each chapter includes key terms and review questions, and the text features special sections highlighting applications of I/O psychology theories, psychological approaches to everyday work situations, and current areas of research and practice. The seventh edition is thoroughly updated to include the latest research on each key topic. It also includes expanded coverage of international issues, job engagement, and emerging topics in the field, such as workplace bullying, virtual teams and organizations, agile organization structures, and web-based training and assessment. The book will be of interest to undergraduate students in introductory I/O psychology or psychology of work behavior courses. For additional resources, please consult the Companion Website at www.routledge.com/cw/riggio, where instructors will find an expanded instructor’s manual, test bank, and lecture slides, and students will find chapter summaries and learning objectives. Ronald E. Riggio is the Henry R. Kravis Professor of Leadership and Organizational Psychology at Claremont McKenna College. He has published nearly two-dozen authored or edited books and more than 150 articles and book chapters. View More In Occupational & Organizational.